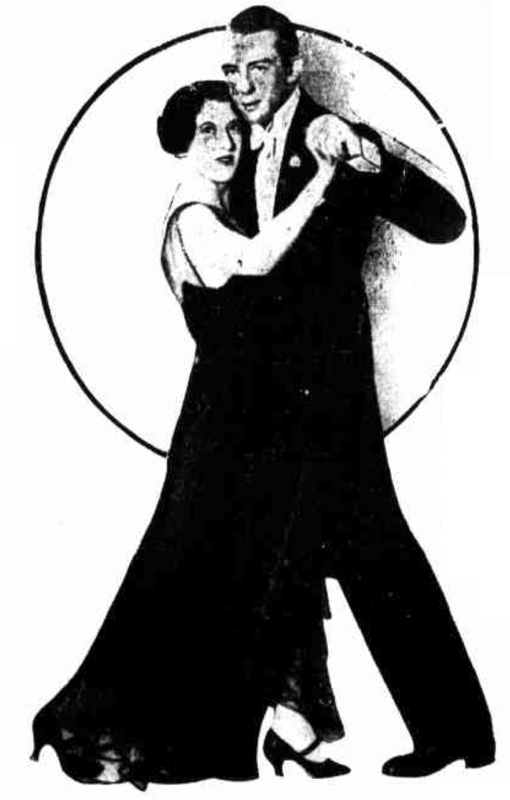 The Moochi is a fun couple dance introduced by Robert Sielle and Annette Mills in 1930 (and brought to the US by Dorothy Cropper). It is essentially a form of Foxtrot in 3/2 time, which allows you to dance a figure with three slow steps (or two slow and two quick, or four quick and one slow) without dancing across the phrasing of the music, as you usually would when the music is in 4/4 [RD14, QT31]. At the time, it was said to have been adapted from a Zulu war dance [CB31]. The name Moochi comes the Zulu mutsha, meaning loin-cloth [IW31]. Moochi Walk: Back the Follow three slow steps, filling one bar (1, 2, 3). "Continue advancing alternate feet ad lib. (preferably for the beginner in any multiple of two bars)" [RS30]. Moochi Chassé: Back the Follow three slow steps (1, 2, 3), then close the feet foot halfway up to supporting foot (and) [RS30, QT31]. Moochi Zig Zag: Side, cross, side, cross, side (1-and-2-and-3), the Lead traveling diagonally forward (along LOD to center of room) and the Follow diagonally back, Lead crossing behind each time, and Follow in front. Then repeat it on the other foot, traveling diagonally along LOD to outside wall [RS30, QT31]. The Moochi: Hands pointed along LOD, step side (1), close (and), then promenade one step along LOD (2), and twist outward, bringing inside feet up between outside feet, inside toe touching the inside edge of outside shoe, inside knee slightly ahead of outside knee (and), and twist inward to face partner, taking weight on the inside foot (3) [RS30, QT31]. Moochi Twist: Twist both feet to the left, right, left, right in SQQS timing (1, 2-and, 3). "The feet only turn on the Moochi Twist, not the body. When proficient, revolve gradually to the right" [RS30, QT31]. Moochi Spin: Slow 180° pivot steps (1, 2, 3), starting Lead backing, turning to right [RS30, QT31]. Wind and Unwind: A full Lead-backing pivot to the right (1, 2), then back the Lead one step (3) and do a full Lead-backing pivot to the left (1, 2), and back the Follow one step (3) [QT31]. As a general style note, the slow steps are often described as having a double motion, first stepping on the ball of the foot (1), then dropping the heel to the floor (and). In addition, one source notes that "when proficient" the "slight parallel turning of the feet" that appears in the Moochi Twist can also be applied to the Walk, Chassé Zig Zag, and first two steps of the Moochi [RS30]. RS30 — Robert Sielle, Annette Mills. (1930). The Moochi, The New Dance. London. CB31 — Carol Bird. (1931, February 15). "Out of the Jungle Comes the Latest Dance Thrill." The Courier Journal (Louisville, KY). QT31 — The Queensland Times (pub.). (1931, March 28). "Here's the Moochi, How to Dance It." The Queensland Times (Ipswich, Australia). IW31 — Iris Wilkinson. (1931, June 4). "Ballroom Arts and Graces for 1931." New Zealand Observer (Auckland, New Zealand). If you or your community is interested in learning the Moochi, .